40 by 25 by 18 ft. 12.19 by 7.62 by 5.49 m.
41 2/3 by 35 by 40 ft. 12.6 by 10.7 by 12.2 m.
30 by 28 by 24 in. 76.2 by 71.1 b 61 cm. 126 by 115 by 114 in. 320 by 292.1 by 289.6 cm. 81 by 125 by 102 in. 205.7 by 317.5 by 259.1 cm. 144 by 60 by 60 in. 365.8 by 152.4 by 152.4 cm. 46 1/2 by 39 3/4 by 38 in. 118.1 by 101 by 96.5 cm. Diameter: 55 1/4 in. 140.3 cm. 48 1/4 by 77 3/4 in. 121.9 by 197.5 cm. 31 by 61 by 17 in. 78.7 by 154.9 by 43.2 cm. Considered a revolutionary Minimalist artist, Alexander Liberman produced works that predated the movement by more than a decade. Liberman, not wanting to limit himself to any one form of expression, worked to produce radically minimalist paintings and sculpture in order to illuminate his beliefs about celestial motion, the movement of the eye, as well as human sexuality. 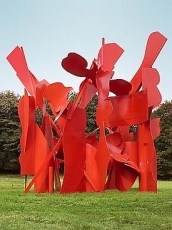 The artist’s fascination with American industrialization and modernization ultimately resulted in his widely known red steel sculptures and geometric paintings, which seem to decompose the turbulence of the time period. Alexander Liberman was born in 1912 in Kiev, Russia. He studied first in London and then in Paris. He took courses in philosophy and mathematics at the Sorbonne and architecture at L’École des Beaux-Arts in Paris. 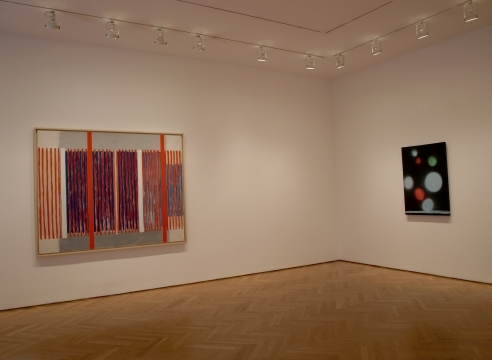 Liberman has had numerous solo exhibitions at museums such as the Jewish Museum, New York (1966); Storm King Art Center, Mountainville, NY (1970); and the Corcoran Gallery of Art, Washington, DC (1970). His sculpture and paintings are included in the museum collections of the Art Institute, Chicago; the Museum of Fine Arts, Houston; the Los Angeles County Museum of Art; the Metropolitan Museum of Art, New York; the Solomon R. Guggenheim Museum, New York; the Museum of Modern Art, New York; the Whitney Museum of American Art, New York; the Hirshhorn Museum & Sculpture Garden, Washington, DC; the Tate Gallery, London and many others. Additionally his public sculpture can be seen in over 40 cities around the world including Honolulu, Los Angeles, Miami, New Haven, New York, Oklahoma City and Philadelphia. Alexander Liberman died in November of 1999 at the age of 87. 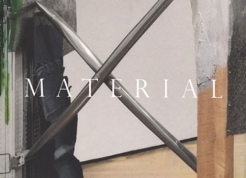 Mitchell-Innes & Nash have mounted an elegant exhibition of 1950s paintings and sculptures by Alexander Liberman (1912- 1999), a Russian emigre who became an influential Vogue art director. As an artist, Liberman developed a hard-edged, geometric style. 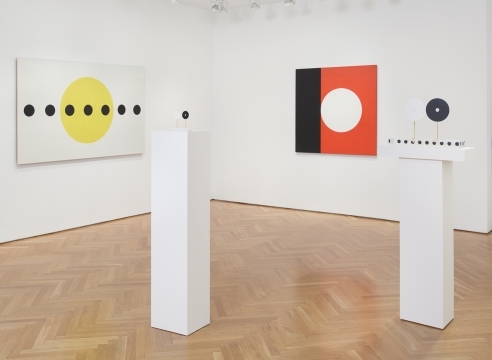 Spot and circle paintings are back on Madison Avenue, but this time they’re not by Damien Hirst or Yayoi Kusama. 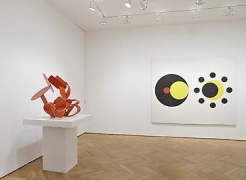 The paintings and tabletop sculptures at Mitchell-Innes & Nash (through October 26) are by Alexander Liberman, and they look as fresh and exhilarating as they did in the fifties and early sixties, when he made them.